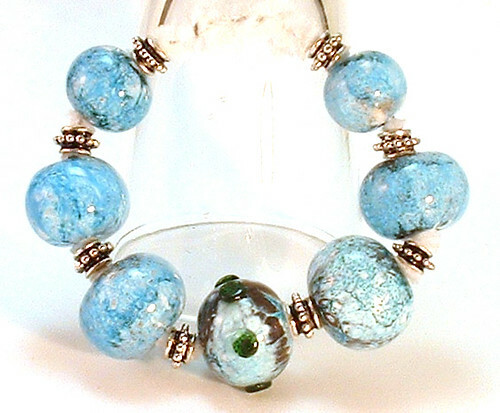 Using Copper Leaf - Lampwork Etc. I had alot of questions about using copper leaf a few weeks ago so I made a tutorial. It is on my website along with a tut. on pulling stringer from frit. Nothing new under the sun, but if anyone is having trouble with these things you might want to take a look. Last edited by LavenderCreek; 2006-03-14 at 10:29pm. Teresa...that was wonderful! Thanks sooo much for doing this. I gave it up long ago because I couldn't get anything out of copper! Now I'll keep on trying. we call it the "Present". Thank you Teresa! So far the only thing I've found to do with copper is boil it into a clear bead for a blue bubbly look. Now I'll try it with other colors! I Tried it a couple times and gave up cuz I thought I had done it wrong! Thanks for the great tutorial! I'm dying to give it a try. I think she actually did use goldfoil on top of the copperfoil! THanks Theresa, your tut is awesome!! I am going to try it out as soon as I get my hands on some copperleaf! Thanks guys, I'm glad you found it helpful! With the gold leaf, you do burnish it on just like any other metal, you don't need to completely cover the bead with gold though, you can just use a few pieces here and there. When you burn it in, just don't burn it in all the way. I have a question for you guys now. Did you find it hard to read the tutorial, or any other part of my site with the background color I used? I just redid the site and it looks fine on my monitor but I have heard that it is hard to read. I am just wondering if others also found it hard to read? Thank you so much for the tutorial!!! To answer your question, I'm having trouble reading your website because the background is so dark. Thanks Jo...dern it, I love those colors, but I guess I will lighten it if everyone is having trouble...drat, drat , drat! Gee thanks. After reading your tutorial, I was able to see what I was missing. I had about given up. Now I will try again. Some days you're the dog. Teresa that was a wonderful tut. I love the copper foil tut. I am going to try it . thanks again for taking the time to let us know about it. Some days it isn't even worth chewing thru the restraints. Thank you Teresa! 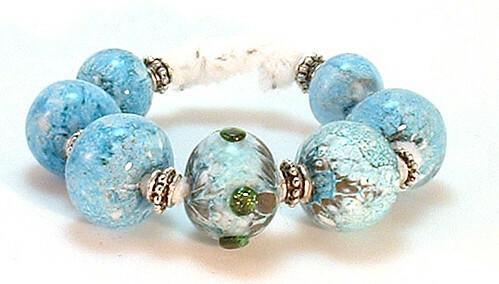 Your copper foil beads are so beautiful! I am a big fan of yours! Thanks again everyone. I am really happy to hear that this tutorial has helped some of you! I just tried this...and I am in love!!!!! Thanks for the tutorial. Leanne gifted me a sheet of copper foil so I could try this. I just need to stop and pick up some white enamel tomorrow on my way to torch! Marci, it gets the most beautiful organic lacy green...like lichens or something....it is beautiful...and you loving green as you do...you'll flip! You guys should post some pictures of your results. I'd love to see! Its true, I'm a green FREAK! This is on a base of vetrofond light grass green and they have been etched. Now I am out of copper foil until the weekend! I really love those Anna! They are so organic, you did a really nice job and you're taking the copper leaf in new directions, that's what it's all about! The avocado looks fantastic on there. Mar, I can't wait to see what you do! I don't know what happened with mine. You can see that I was banking on them to cool more green, because I put green aventurine dots on one of them (thank you for the chunks Anna!!). But, they ended up cooling a world-scape blue tone. Did I not cook them enough? Did I cook them too much? Did I not let the base bead cool enough before I encased them? I don't know. I like the effect, I just was hoping for green. I used light ivory on some beads, and dark ivory on others. That part didn't seem to have too much of a differing effect. (Sometimes I can't help myself, I must try a few different things, see which I like the best.) The only thing I did on some that you can tell a difference, is I used white enamel powder, and then rolled that, in a bit of white enamel #0 frit. This made the middle bead look different from the others, with the bigger dark spots in it. Oh, I was also wondering, should I lower the oxygen? Or lower the propane? Did you switch levels for anything? (I'm on a Bobcat, if that helps.). Mar, those are really beautiful! Since you like to experiment, try putting small strips of silver leaf after you've cooked in the copper, then burn that in. Don't cover the whole bead with it, just in places so you can see what it does. You really have some beautiful colour there! I think you definitely cooked it enough because your colour is shining through nicely with no ugly black/grey junk. I have never tried the copper without enamel so I am not sure how well that works or what sort of reactions you get without it. I use a Carlisle and I work in a neutral flame. I do use other stuff to get the verdigris that I get, but I am not ready to reveal all my secrets just yet. My main aim with this tutorial was to show how to burn the copper in and get colour with it, instead of grey ash. Experiment and see where it takes you. You've got the technique down, now you just need to play. Great job! Marci, I really love the colors you got! Wow! I have always gotten green...never that pretty blue! How weird! I usually use white enamel, but have also used green and when I did it without the enamel I got about the same kind of effect. I just heat the bead until it is no longer ashy. It comes out really cool on silver plum too. Marci, I love the green sparkly dots....beautiful! The link to this 'free' tutorial no longer exists. Is it possible that someone here might have a copy of it archived somewhere, that they might be willing to share? I'm guessing that the technique might be starting with a non-reactive base color, coated with white enamel, and then cooled down enough to apply the copper leaf. I'm guessing there are more detailed tips in the tutorial. Hey Shrimp ~ if you go to www.archive.org you will see a link at the top of the page for the “wayback machine”. Type the address of the expired link into the search box and it will show you when/if their search engine archived that particular page. Click on the archive dates and it will show you what the page looked like on a specific date, even if it has since been deleted or changed. Works on most old tutorial links!